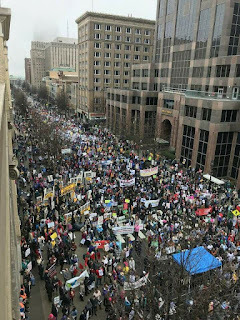 With the theme, ‘Taking Resistance to the Ballot Box,” the 12th Annual Moral March/Historic Thousands on Jones Street People’s Assembly in Raleigh Feb. 10th attracted thousands of demonstrators from across the state despite heavy rains. 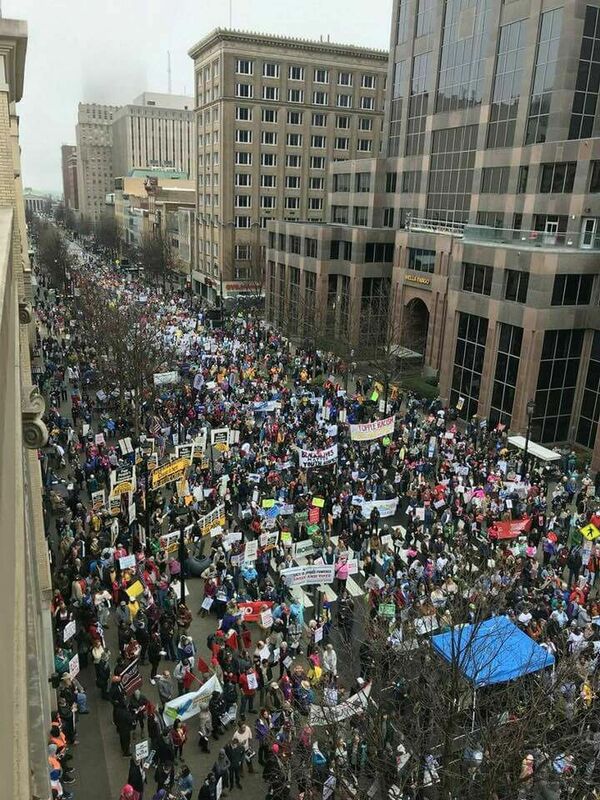 With protest signs castigating everything from the Trump Administration, to North Carolina’s legislative Republican leadership, the extraordinarily diverse crowd of young, old, black, white, Hispanic, straight, gay and others, marched through downtown Raleigh from Shaw University to just outside the state Capital. There they heard from a plethora of speakers, representing the unique coalitions involved, all imploring those gathered to make sure their voices, and votes, are heard come November for the midterm election. Bishop Dr. William Barber, the former president of the NCNAACP, spoke to those gathered by phone, urging them to indeed turn out the vote, regardless of whatever barriers or restrictions are thrown at them. 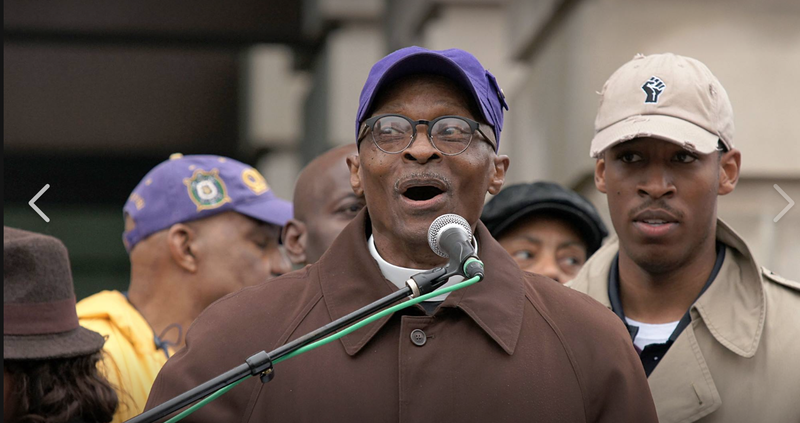 But the highlight of the event were the pointed remarks of the NCNAACP’s new president, Rev. Dr. T. Anthony Spearman, who used biblical analogies to illustrate the need for justice, and invoked inspiration from civil rights leader Dr. Martin Luther King, Jr. to crystallize the societal evils that the NCNAACP leader said must be confronted. “Moral Resistance is the means we use to dismantle the engines of destruction that drive us away from the mainlands of democracy while steering us toward the mountains of fascism,” Rev. Spearman offered in a prepared speech. Rev. Spearman called on NAACP members and coalition partners to “…take your resistance to the ballot box…” per the 2018 midterm elections, and ultimately the 2020 presidential election. From now until noon, Feb. 28th, candidates for all state offices, except judgeships, will be filing for the 2018 May 8th midterm primaries. Filing began Monday without a hitch, though at the end of last week, observers were concerned that another unexpected court order could possibly delay the process. Indeed, on Friday, Feb. 9th, the Fourth Circuit U.S. Court of Appeals issued an order that candidates for the NC Supreme Court and state Court of Appeals could not file for the May 8 judicial primaries, because they will not be held. Instead, those candidates will file during a special judicial filing period June 18-29. That order stayed an original ruling by federal judge who ordered primaries for state Supreme and appellate court candidates, but not for district and superior court candidates. The Republican-led NC legislature last year passed a law eliminating the 2018 judicial primaries for all judicial candidates because of judicial redistricting, but Democrats successfully challenged that law. The federal judge reinstated the judicial primaries for the state judicial races, but not for district and superior court races. Now, that’s to the fourth Circuit appellate court, there will be no May judicial primaries, and the special June filing period will go forward, unless a court stops that as well. The legal back-and-forth have state Republican legislative leaders seeing red. Thus far a three-judge federal panel has had Republican 2011 legislative redistricting maps redrawn twice, finally ruling that the maps drawn by a court-ordered special master be used for the 2018 elections. Republicans successfully petitioned the US Supreme Court, in part, to stay that order for Wake and Mecklenburg counties alone, pending review. Republicans also were successful in getting an order by another three-judge panel striking down their 2016 partisan congressional maps, stayed by the US high court. That stay is pending review of two other partisan gerrymandering cases the US Supreme Court is considering elsewhere in the nation. Rep. David Lewis (R-Harnett), co-chair of the Joint Redistricting Committee, held an angry press conference last Friday, demanding that Democrats drop their court cases, and simply allow Republicans, who are in the legislative majority, to carry out the will of their supporters. “These Democratic groups lose in state court, they run to federal court. When they lose in federal court, they run back to state court. It is judge shopping, pure and simple,” a livid Rep. Lewis told reporters. “They are trying to ignore a Supreme Court decision that came out less 24 hours ago! [RALEIGH] If you ant proof that this is an exceptional hard flu season in North Carolina, look no further than the Wake County Public School System. On Monday, 1,283 teachers, or 11% percent of the entire teacher force for the system, called in sick because of the flu. The closest to that number was 792 back on October 2, 2017. Like other school systems across the state, Wake depends heavily on substitute teachers to fill in during this time of the year when teacher absences are expected. [RALEIGH] Bowing to some concerns that several public school districts across the state are too large, legislative Republicans say they want to study the situation in hopes of eventually breaking some school systems up into smaller districts. A newly-formed legislative study committee is scheduled to report back on May 1st. Republicans House members Bill Brawley and John Bradford of Mecklenburg County, and Chris Malone of Wake county, are the primary sponsors of the bill. Opponents say breaking up the school districts is just another way of reinstituting racial segregation. Both Wake and Charlotte-Mecklenburg school districts are the largest in the state. WILL GOV. COOPER VETO NEW CLASS-SIZE BILL? [RALEIGH] State lawmakers have now ended their Special Session and gone home until the short session scheduled in May. But before they left, they pasted a controversial bill, HB 90, lowering class sizes, which many parents demanded. However, attached to the bill are things that Gov. Cooper doesn’t like, like legislative control of a $58 million mitigation fund for the Atlantic Coast Pipeline, which the governor is supposed to control. And yet another section of the bill, once again, merges the state Board of Elections with the Ethic Enforcement Board, adding one member to the eight-member board. Gov. Cooper favors the class size portion, but ha signaled he’s not please with the rest of HB90. So the question remains, will he sign it into law?